The valentine season means love and passion; you may want to enhance your bedroom with new inspirations of love. How to make your bedroom loveable and comfortable with simple steps for you and your spouse? In this article there are some helpful tips to enjoy valentine bedroom decor. As we all know that valentine is popular of red color. The first step is to integrate the valentine colors into your bedroom decoration but keep in mind even if red is the love color, it can’t be also the only color to use. So you have to combine the other colors like white as it is the symbol of purity and calmness and the pink which is so feminine. Thus you can make a comfortable and loveable atmosphere. 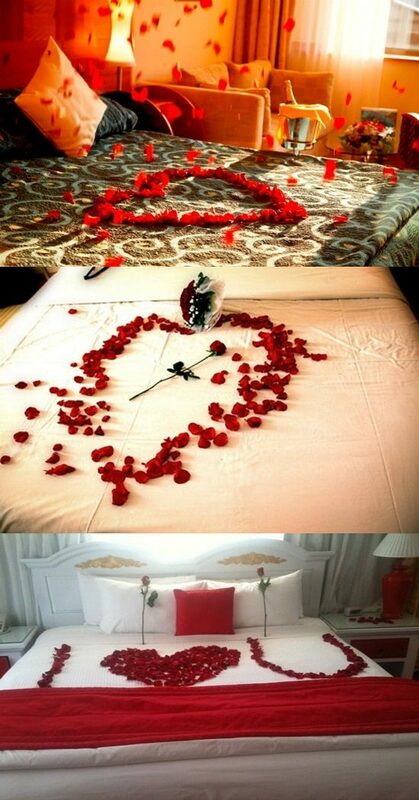 Begin with the bed sets; use red satin sheets with heart-shaped white pillows and you can also add pink rose petals on the bed with heart shape as well. You may also prefer to add a beautiful romantic touch by using African artifacts which are rich of warm colors, spirituality and fertility symbols; they add also much more of mystic and mystery to your valentine interior decor. Then you shall give the room warm and welcoming feelings by add the proper light accents and candles. Place lamps on both table bedsides to create attractive look with some candle lamp or some spots with red and white shades for a romantic feel. Remember the music is a perfect add and relaxer, play the favorite music mood for you both and add a gorgeous retreat touch by a bubbling water fountain. The last simple step is to add special accents to enhance the entire romantic feeling; flowers, chocolate box gift, special romantic curtains, carpet and spread some heart balloons. Don’t forget also to put your personal photos together on the whole or add a creative video tape of your photos and play it over and over again.